It’s all about water harvesting and daily water use. It started me thinking about how we use and conserve our water. 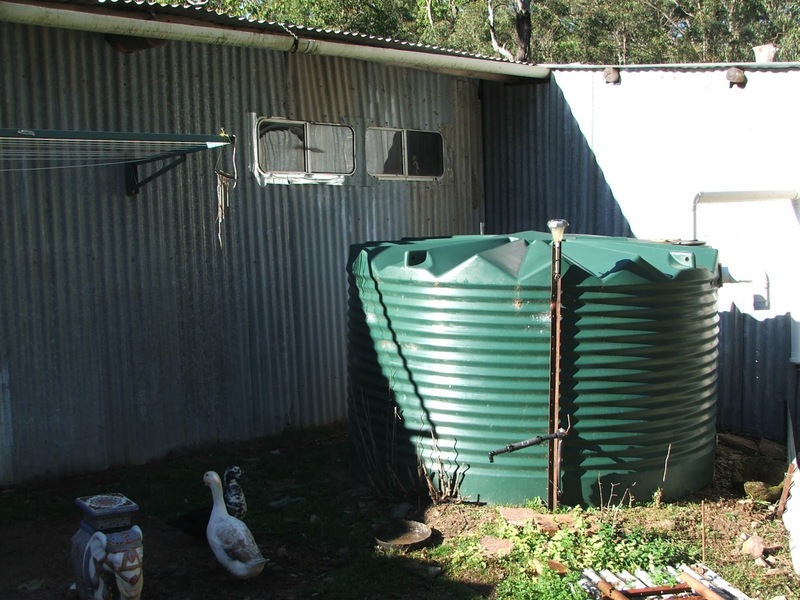 So I thought I would share the broad details of our water harvesting and use here in the humpy. 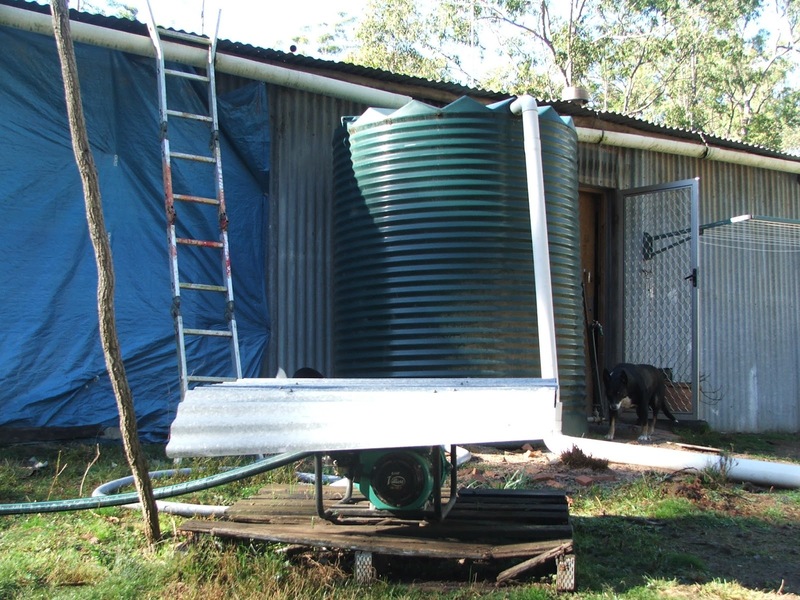 When we moved here we had one 1000litre tank which harvested water from the roof of the humpy (about 6 x 9m then). There is no mains water here, if you want it, you have to get it yourself. We have gradually increased our storage to 5000 litres on the humpy (in the form of two tanks) which are pumped to the top of the ridge into a 22000 litre ‘header tank’ which gravity feeds back to the humpy. The ‘pump up’ tank; 2500L. The pump is that thing under the tin in the front. Of course in dry weather our usage goes up as the garden uses more and the animal water needs refilling more often, I would add another 100L per week to the tally for dry weather use. Because we have had good rain over the last five years it doesn’t seem as important to conserve water at the moment, but the one thing you can count on in the bush is that there will be drought (and fire and flood and locust plague). 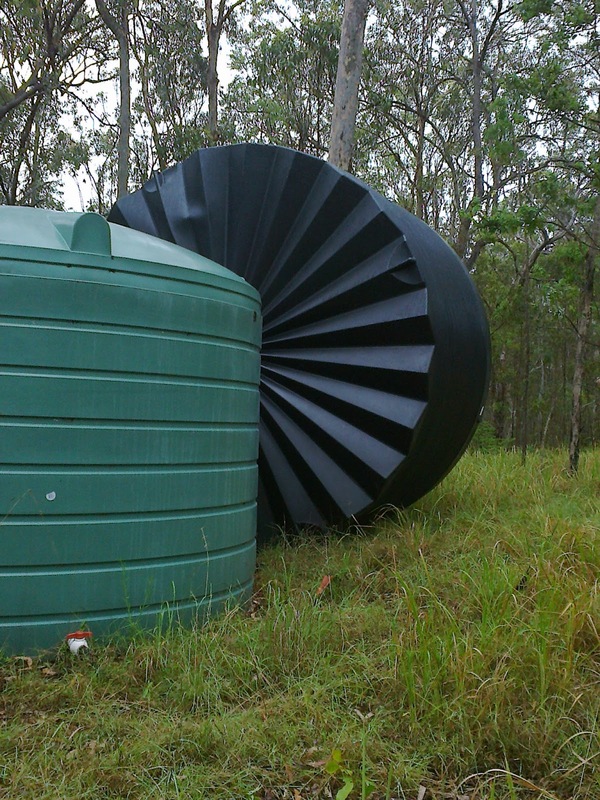 With this in mind, we recently bought a larger header tank (27000L) and plan to move the old one down to the humpy so we can harvest every drop that falls on our roof. With all that storage and at current usage, we should be able to survive for a year without rain. How do you rate your water usage? What do you do to conserve water? I can always use more ideas? ← It Doesn’t Take Much….